One of the initial challenges in producing quality youth theatre is finding scripts which are suitable for your particular youth theatre groups and which simultaneously challenge both audiences and young actors. To help ease the process, we’ve put together some top tips and points to consider when choosing plays for young actors- along with the help of Prague Youth Theatre’s Artistic Director, Adam Stewart. The ideal play should spark the actor’s imagination and make the maximum demands on his or her creative involvement. But where do we even go to find a script? Choosing the right play can be a tedious experience but luckily there are SO many scripts out there to choose from and discover. A number of catalogues are available online listing hundreds of top quality plays ready to be performed by your youth theatre or drama group. For example, Playscripts is home to over 2000 plays and musicals for download and you can even refine your search to include your organisation type, play type, genre and cast size. Youthplays is a similar recourse offering lots of plays to browse through. From ten-minute plays to musicals, there is bound to be something worth performing here. We also highly recommend that you check out Playshare which is a super useful digital recourse for finding youth theatre material. Playshare is a fantastic collection of plays fit for youth theatre groups and is available to download from the Youth Theatre Ireland website. All PlayShare scripts have been written specifically for young people and differ in length, content and style. There are also many reputable books and anthologies worth looking at. Connections is the National Theatre’s annual festival of new plays for young people. Each year the National Theatre commission a number of plays for performers aged 13-19 which are then published in the Connections Anthology and which is available for purchase. So far the National Theatre has commissioned over 150 exciting plays for Connections. It is important to choose material that is an appropriate length for the time period that you have to rehearse. Consider whether your young theatre or drama group can learn their lines from the time you start rehearsing until the performance. Is it a length that will keep your audience engaged and most importantly your young actors? Do you have enough rehearsal time to cover the play effectively? 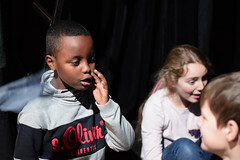 For some young actors, this might be their first introduction to performing and so it is important that they are comfortable, engaged and having fun throughout the whole process. For example, you might consider a one-act play for a younger group and a two-act play for an adolescent group. Is your play relevant to the age group you are working with? It is esential that you choose a play which uses language that the young people you are working with can master. You should consider whether the characters in the play are in the actors’ emotional and imaginative scope. It might be interesting to find a play that says something worth taking about, or feelings worth communicating to the audience. Choose themes that your age group can approach already having some sort of familiarity with. For example, you might choose to explore the pressures of social media with teenagers. This is the serious part. Plays are what pay playwright’s bills and unpaid royalties might mean a playwright’s unpaid phone bill or rent for the month. More so, violating copyright is illegal and expensive and so it is important that you read the rules carefully. When producing a play, it’s vital that you get the playwright’s permission whether that is through them personally or their agent or publisher. You will need to fill out a contract agreement, and have paid or made arrangements to pay the royalty. Different plays will assert different rules on photocopying restrictions as well so make sure you have read the small print in advance.